The electronic age offers new technologies to drive the world of design. Ukrainian fashion designers Masha Reva and Ksenia Schnaider certainly got the memo. They’ve used platforms in digital media to create and transfer photoshopped prints onto fabrics, and to engineer printed motifs. Due to their digitized graphics, both Spring collections have been quite a success, and are now available in the US! Photorealistic prints add a special tech-savvy touch to items currently in fashion. The Masha Reva x SNDCT line looks are botanically bodacious. 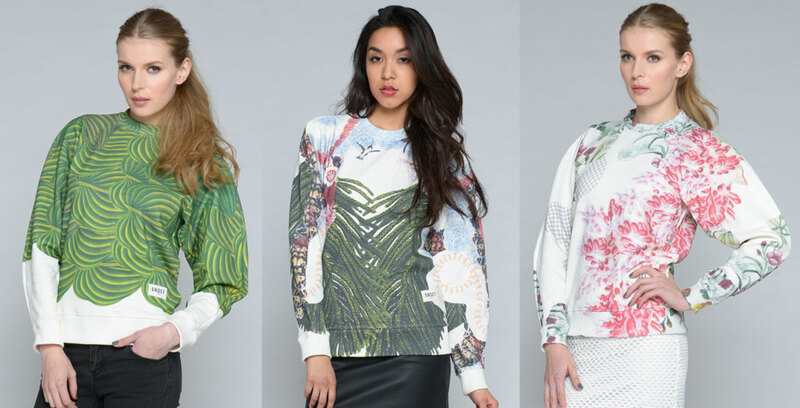 Each of her layers of botanical bliss is screen printed onto a sweatshirt silhouette. She makes an ironic statement by creating computerized images of organic objects – a sort of ‘digital nature.’ This concept is in itself an oxymoron: a contradictory concept that actually makes sense. Masha Reva x SNDCT toys with the idea that we are seeking to get out of the hustle and bustle of our modern lives, which are overrun with technology, and back into our natural element. Ksenia Schnaider manipulates an earth-toned pattern and goes graphic. She delivers a fun take on the camouflage trend by packaging the print in a bright aqua color palette. Ksenia Schnaider’s aesthetic is architectural, and her shapes are simple and classic. Either with black color blocks, or white, sheer insets, she puts this collection on the contemporary map. Shop Anthom.com – and fast, these digitized designs are selling out! I’ve been working on doing fabric design with my photography and it’d nice to see that someone is creating pieces using that concept!